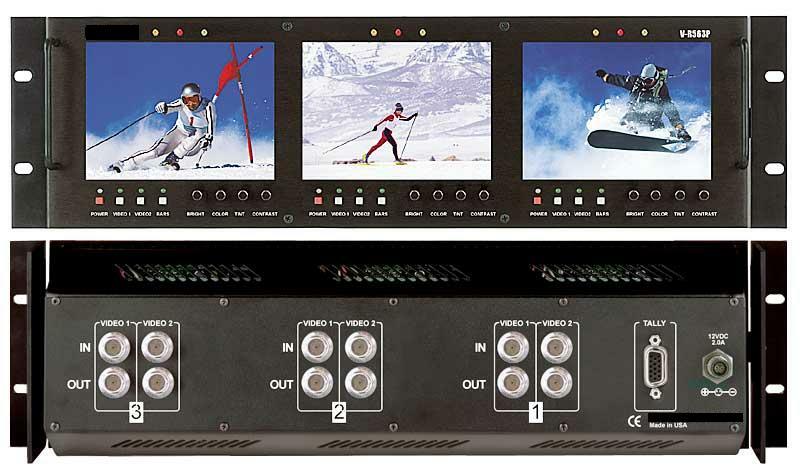 The LCDR3U5.6-01 is a rack mounted unit that has three independently controlled 5.6" active matrix LCD panels with active loop through feature. These 5.6" panels have 960 x 234 pixels producing a true high resolution image. This unit also has a unique feature that allows the unit to tilt up or down for optimum viewing angle. The unit fits into an EIA standard 19" rack, 3U high. 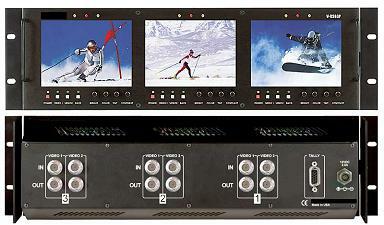 Each screen has two composite video inputs and outputs, and 3 color tally system. Each of the three screens has a built-in color bar generator, individual front mounted selector buttons with LED indicators and color, tint, brightness and contrast controls. The unit includes power supply, manual and features auto recognition for NTSC or PAL.